Do you have a very good skill and logic? 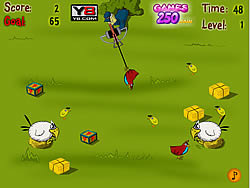 We offer you a new game where your mission is to collect as many chickens, eggs, puppies, box of surprises and a hay to earn more money and more points to go to next levels. Be careful because you are on limited time where you can collect all this to pass the level.